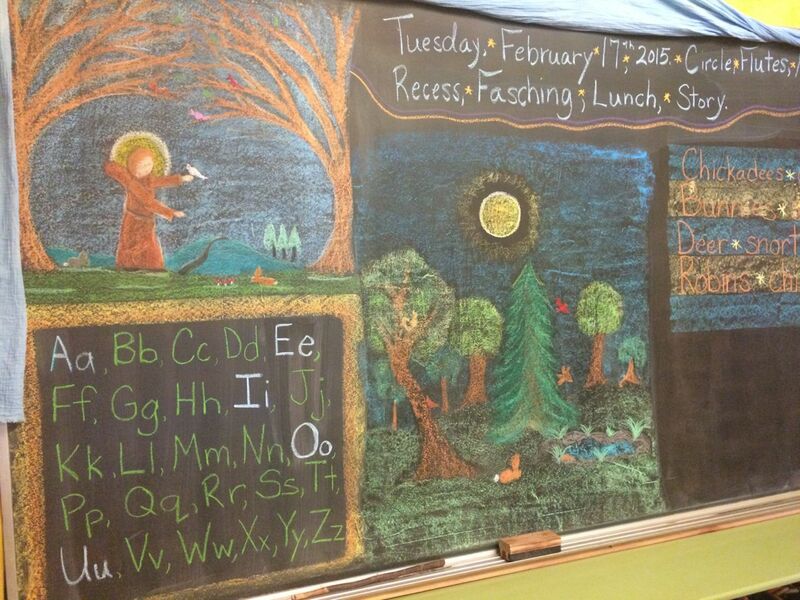 In January our classroom was full of back-to-school energy after winter vacation! It was fun to see the girls return with stories of their adventures over break, and enthusiasm for sharing. We began with some journaling. I had them write for 20 minutes about anything they wished to share about their winter vacation. 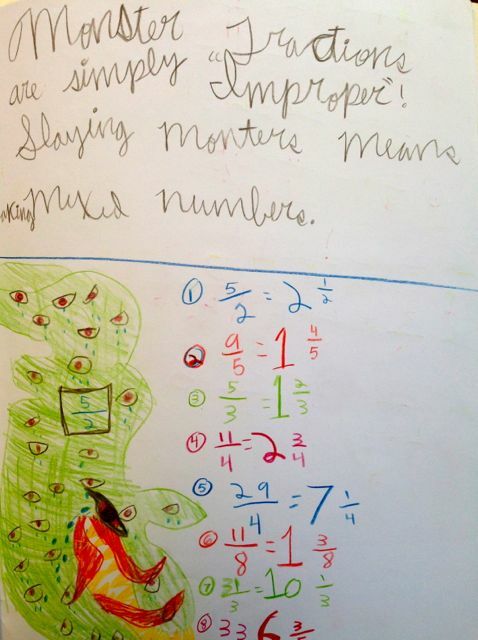 Then I read excerpts from my own journal I wrote in fourth grade. We discussed how helpful it is to get your thoughts on paper, especially when facing big life changes and transitions. 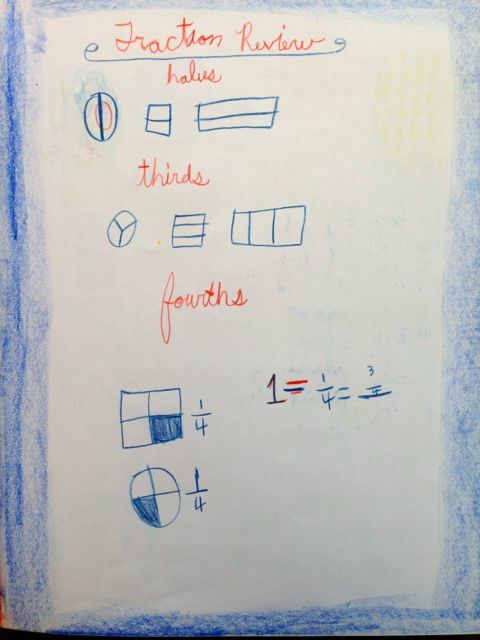 Next, we worked on a couple form drawings to get us back into our class rhythm. 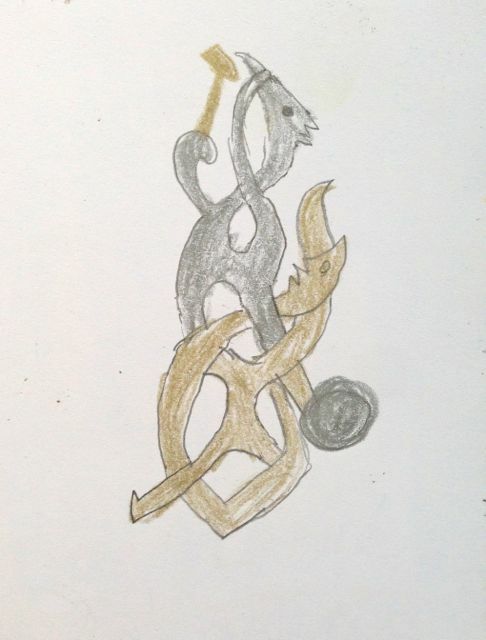 The fourth graders started with a Celtic knot and then progressed to creating small Norse characters with knotted bodies for their Table of Contents pages. 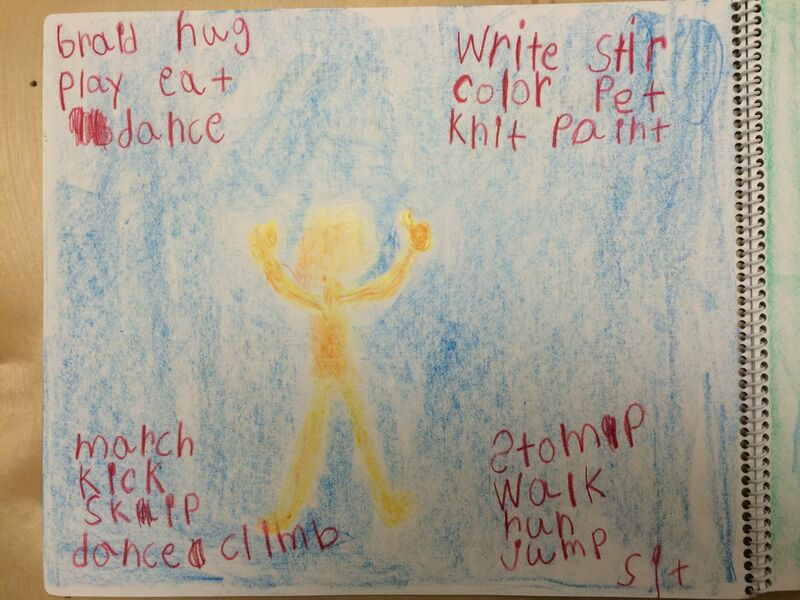 Emma practiced a mirror form to border her Table of Contents. 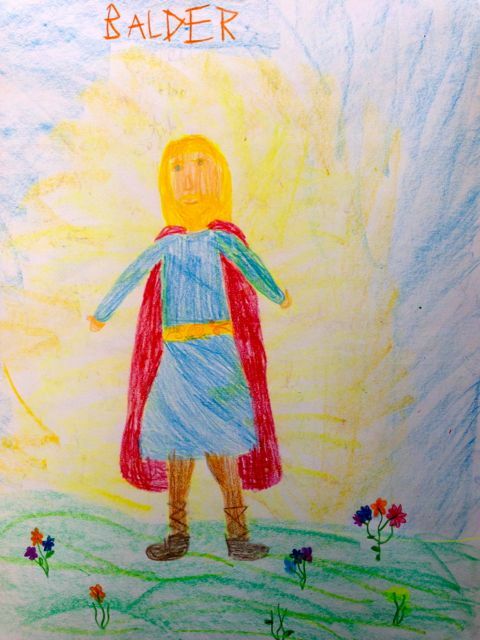 We returned to Norse stories with the tales of Balder-the God of Light, Heimdall- the Watchman, and learned how Njord, Frey and Freya came to live with the other gods in Asgard. 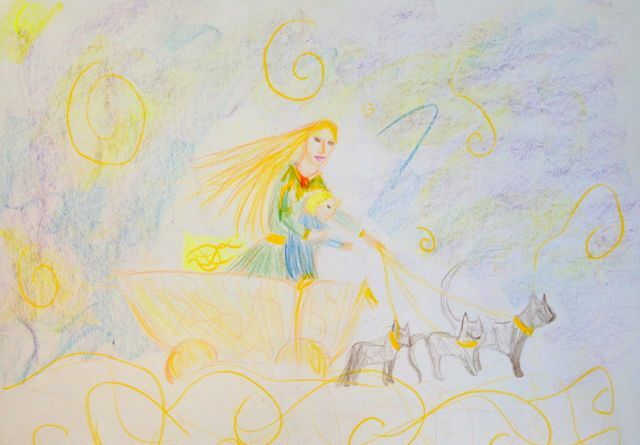 Freya is the first goddess to be introduced in greater detail, and she rides in a carriage pulled by grey cats. Needless to say, the girls love her. Freya was the basis of our main lesson bookwork at the beginning of Week Two. 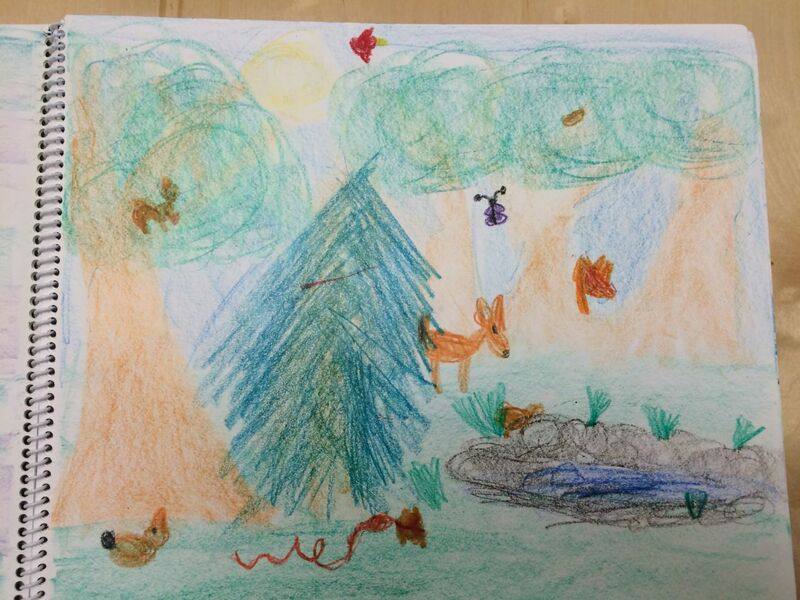 We completed a drawing and recalled the story before they began their independent writing. I was very pleased with the students’ focus and motivation to improve their writing this week. The fourth graders each wrote 7-10 sentences on their own about Freya, which required some tricky summarizing of multiple days of stories. In addition to their ability to sit down and write on the rough draft day, they each returned the next day with fresh eyes and willingness to identify any weak sentences and areas for revision. 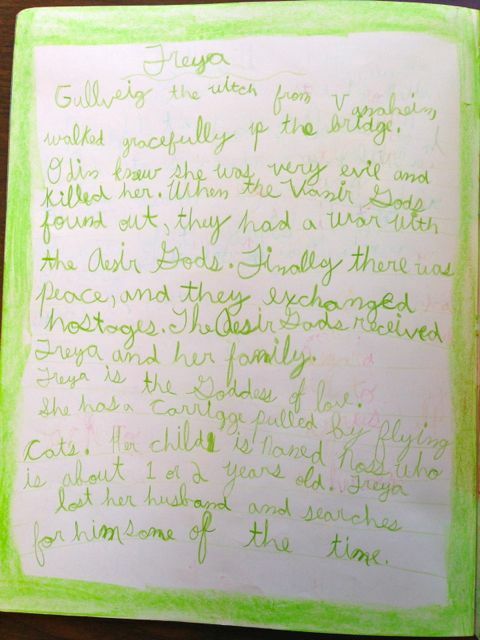 We discussed how self-editing will be a useful skill for the rest of their school career, and that even the most accomplished writers find it difficult. To add another necessary skill to their toolbox, we introduced dictionaries this week. The school used some of the materials budget to purchase 5 student dictionaries for my class, and the girls love them! It is yet another example of how their enthusiasm for knowledge and learning catches me off guard and brightens my day. I asked them to first alphabetize their spelling words, then look up the definition to each. 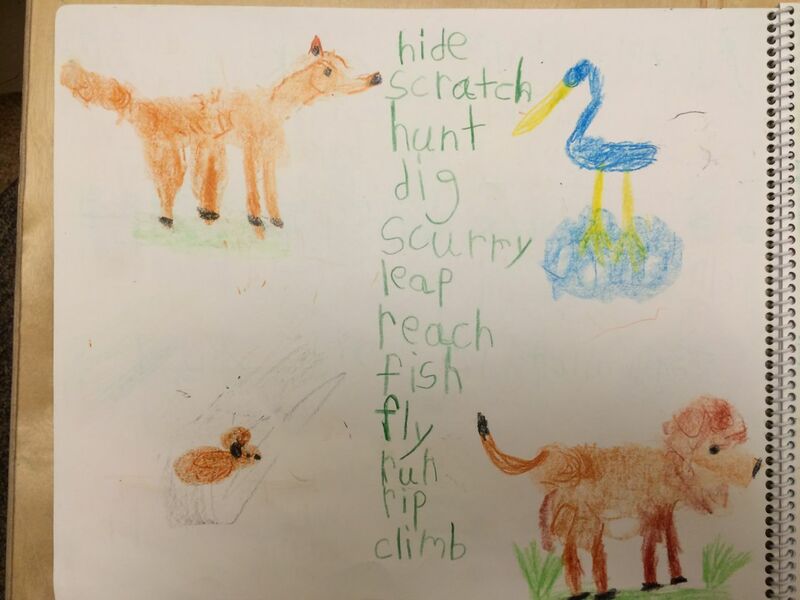 Though they did not all finish their lists, they quickly learned strategies to speed up their searches. We will continue to practice using the dictionaries in various ways throughout the semester. 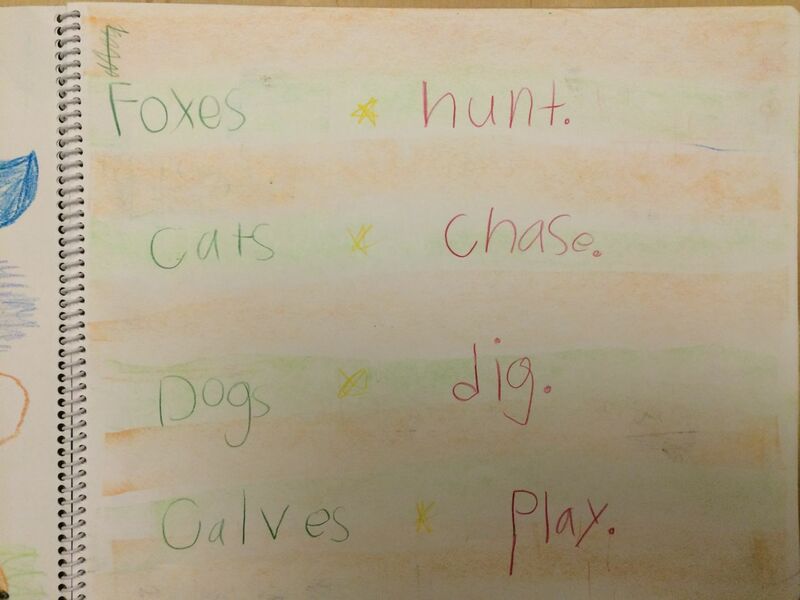 Now that the students know how to use them, they are hungry for new words! 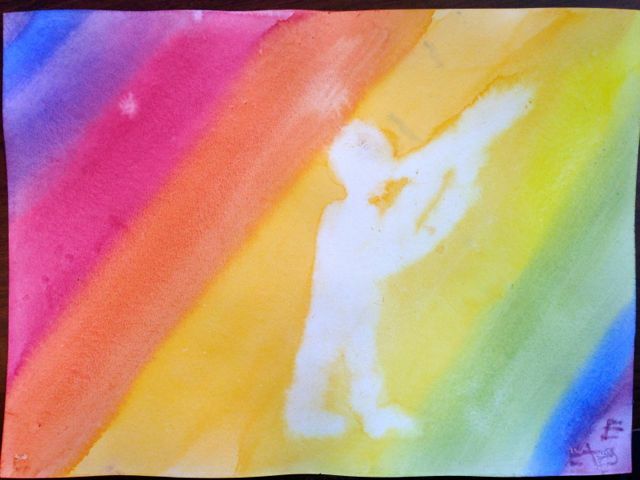 On Thursday we painted an image of the rainbow bridge, with Heimdall in the center keeping watch. 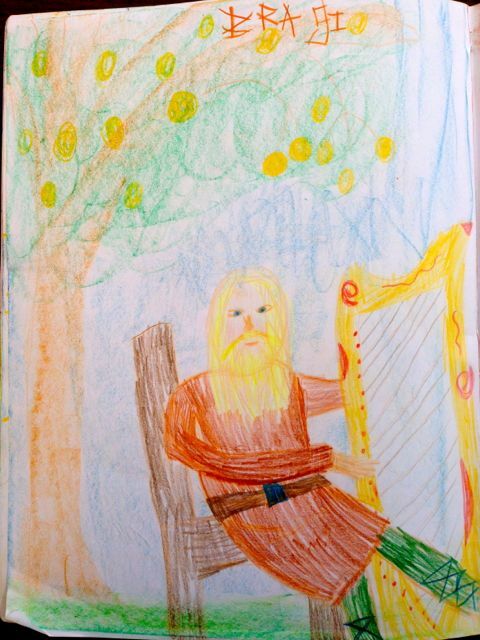 This required a good sense of spacing to fit in all of the colors of the rainbow across the page, as well as control over the brush while lifting off color to form Heimdall’s body. 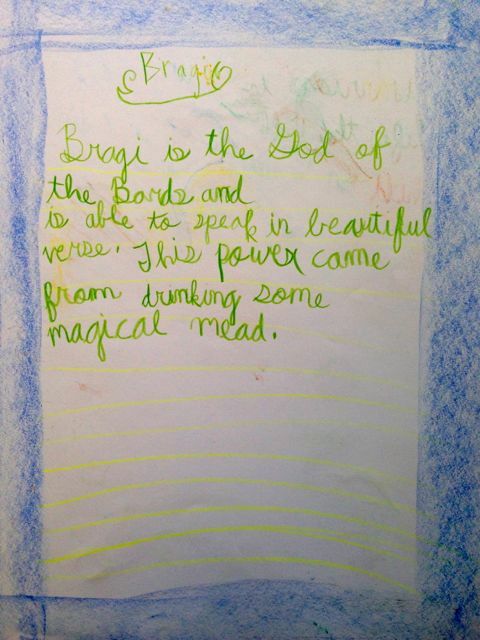 This week, in addition to writing about Freya, the students drew and composed sentences about Bragi, the God of the Bards. Since the story explained how the beauty of verse was introduced into our world, it began our class exploration of poetry. 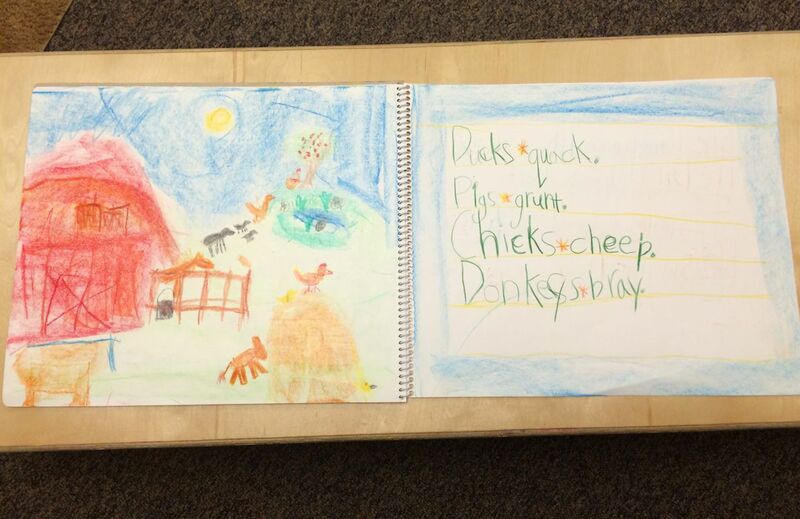 We started simply, with each student describing herself with words that use the letters in her name. 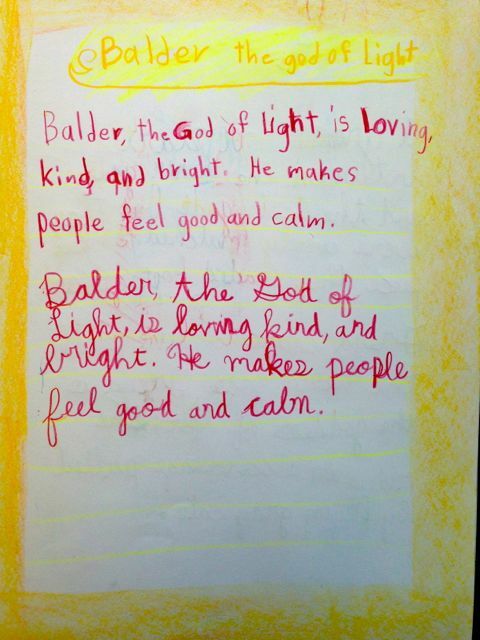 They completed this in their journals on Friday, and we will continue to add to them. 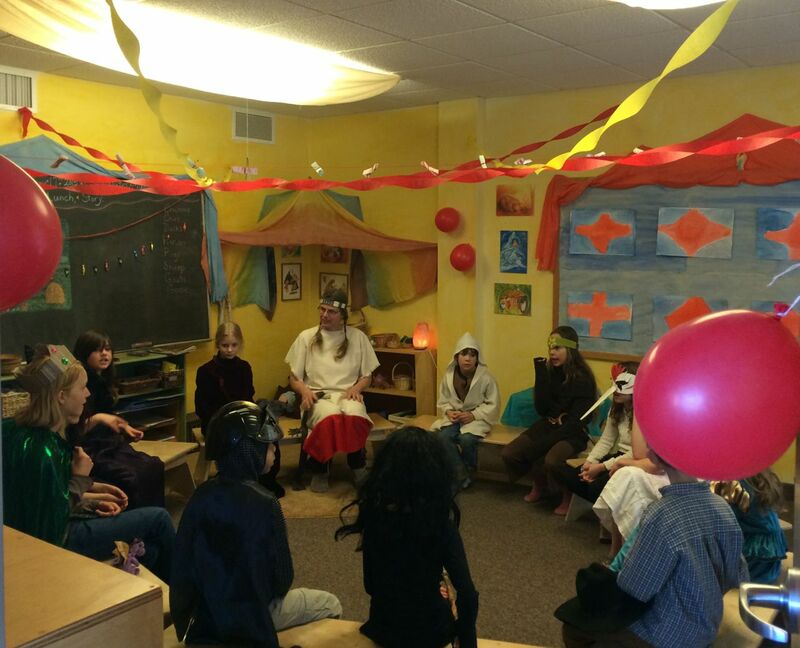 Our final activity for the second week was a dramatic reenactment of the Valkyries and the Valhalla. This was my special treat to the girls for working hard all week, and they really got into the story! We used props to help us embody the warrior women who pick up fallen heroes from battle, and bring them to feast and fight for eternity as Odin’s heroes in Asgard. It was hilarious, and I’m sure they’d be eager to provide your families with a replay! In our final week of Language Arts, we tackled the stories of Frigga and her Goddesses, Freya’s Necklace and Idunn’s Magical Apples. 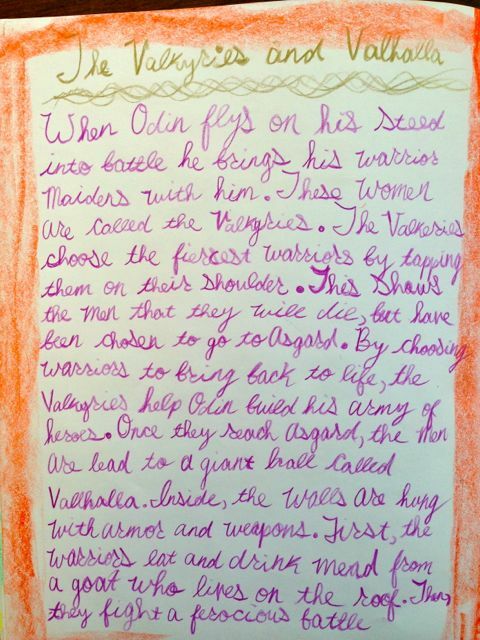 With a short week, we limited our writing work to summarizing last week’s reenactment of the Valkyries and the Valhalla. I began with a lesson on paragraph construction. We discussed the key components of well-structured writing, and that a clear structure helps the reader follow your train of thought. I gave plenty of silly and confusing examples of jumbled writing, then we wrote a 5-sentence paragraph together about the Valkyries. 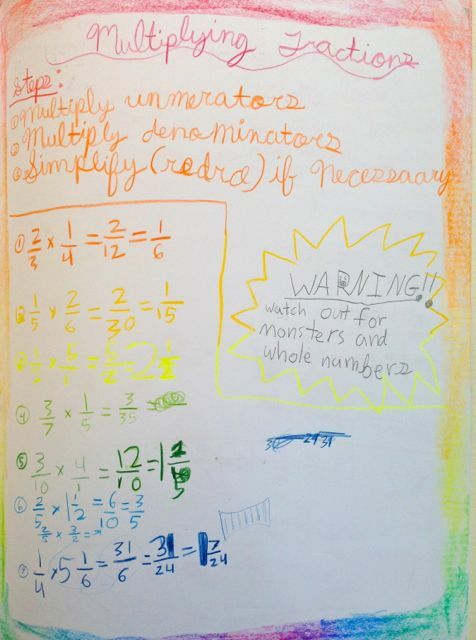 With an example before them, the 4th graders were challenged to limit themselves to writing only 5, well-composed sentences about the Valhalla and the life of warriors in Asgard. Emma went straight to copying our group paragraph into beautiful cursive in her main lesson book. 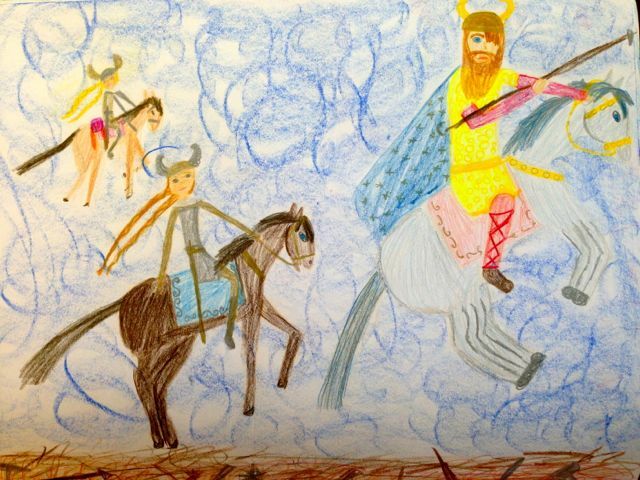 Our drawing of the Valkyries took us multiple days to complete, as it included many women on horseback and a battle scene. 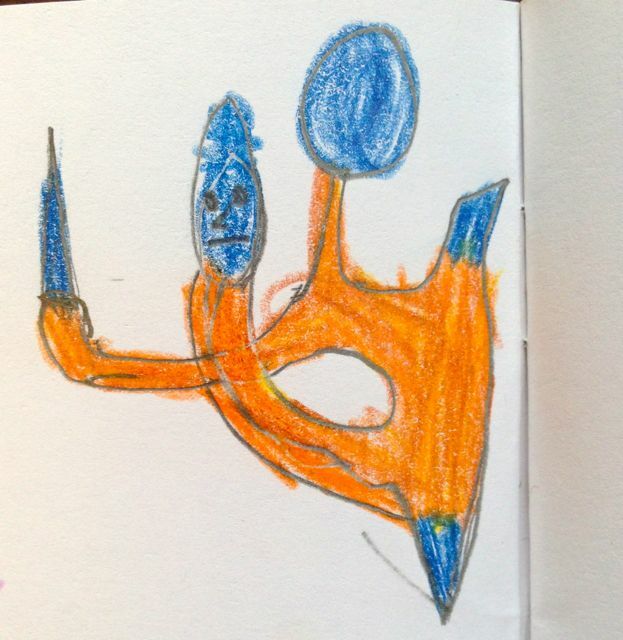 It was a challenge, and had us all marveling at the complexity of drawing a horse’s legs! We fit painting in on Thursday, and reveled in the vibrant colors of pink and purple. 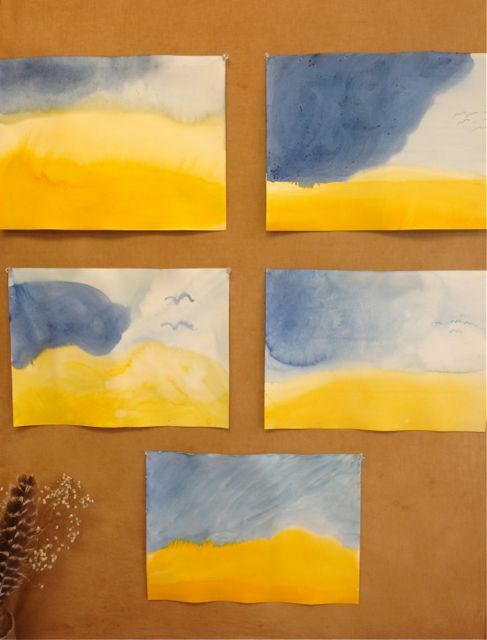 The students were directed to place strong Prussian blue and Carmine red on their paper, and then had the freedom to explore the wide range of shades in between purple and pink. We threw out many names for the hues as they were unveiled, and I challenged them to try and achieve a smooth, gradual transition between the colors. Though this was a color experience without a clear form, it was challenging and required good control over the amount of pigment and water used. 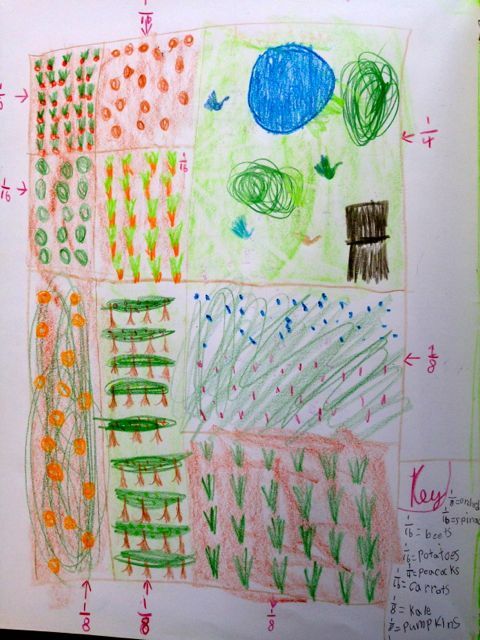 The girls were pleased with the results, and it was a nice release after our precise and focused work on the drawing. The wide, steady, sweeps of a brush during wet-on-wet watercolor is wonderfully soothing, and smoothes out the self-criticism that creeps in as we take on more challenging art projects. 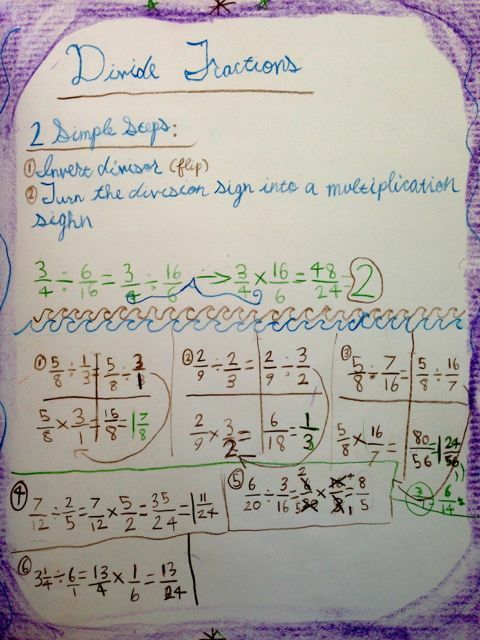 We are continuing with daily math practice each morning. 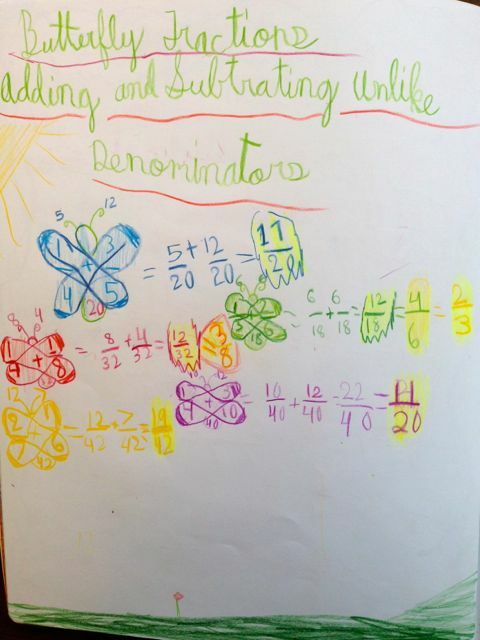 Over the three weeks we reawakened our memories of fractions from before break, and practiced putting a range of mixed numbers into increasing or decreasing order. 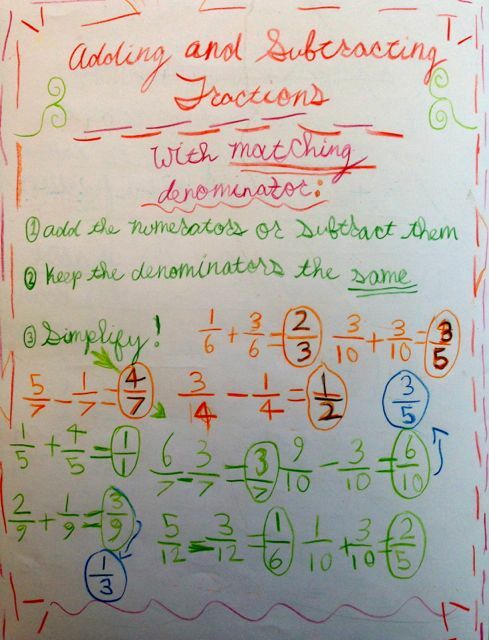 We also kept fractions alive in word problems and math games to help prepare us for our next block. We continue to rotate between silent reading and our group reading of “Abel’s Island” in the last half hour of each day. I take ten spelling words from the reading each week, for our Thursday quizzes. In Circle we learned a poem about winter, and sang songs that incorporate more movement and marching. This really woke us up in the morning, even on the sleepiest days! In our King Winter song, we progressed from first marching all together, to maintaining various rhythms of claps and instruments simultaneously. 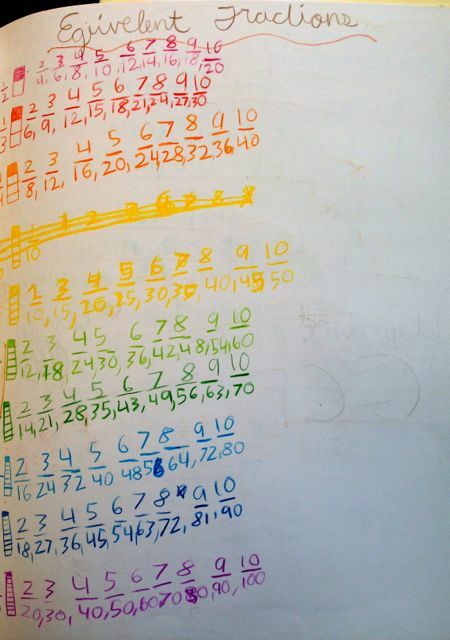 This is a great challenge for students to maintain contrasting rhythms while continuing to sing together as a group. Additionally, I incorporated some coordination games that worked on our dexterity and required crossing our midline, adding to the element of challenge and fun. King Winter is now in the land. He makes Jack Frost touch nose and toe, and brings us bright and shiny snow.